There are various forms of organizations available in the constitution to register and operate a business in India. Out of all, the Company form represents one which operates a business on a large scale. These ventures are guided by the Ministry of Corporate Affairs (MCA) under the Companies Act, 2013. Unlike companies, MSMEs are special entities recognized by the government through the Micro Small & Medium Enterprises Development Act, 2006 (“MSMED Act”) which operates business as Micro, Small and Medium Enterprises. MSMEs generally lack in investment and fund sources which they receive as assistance from Government of India (“GOI”) in the form of various schemes and policies. In order to allocate the benefits of credit schemes and development policies to eligible entities, the Government introduces the concept of Udyog Aadhaar Memorandum (“UAM”). This article highlights the registration of entity under Companies Act, 2013 and Micro Small & Medium Enterprises Development Act, 2006 (“MSMED Act). To register as a company in India, the applicant has to comply with regulations prescribed for companies in the Companies Act,2013. The Act particularly defines all rules and regulations to be followed by companies starting from incorporation, to defining the composition of members, to liability structure, to reporting of standards, to filling of compliances and all related norms required till the dissolution of the company. To incorporate a company, it is necessary to go through the required registration process on the MCA Portal, a single platform for company compliances. To register to submit the proposed name, and other prescribed documents in INC SPICe – 32, an integrated form for registration. A company is registered on receipt of incorporation certificate in Form INC- 11 from the MCA. Hence, it is a registered company. The definition of MSME is inclusive of entities which operate a business on low investment and are generally engaged in manufacturing & rendering of services. These have been recognized as the engine of growth of the economy by government. Because these entities lack recognition in government policies and are deprived of the investment funds, special recognition has been given to these entities by the government through Udyog Aadhaar Memorandum (“UAM”). Udyog Aadhaar Memorandum (UAM) is a 12 digit legal identity document issued by Ministry of MSME to recognize MSME entities and to help them in availing different benefits issued by the government for MSMEs like collateral-free loans, assistance in finance required for market research & technology advancement, tax exemptions, and subsidies, etc. To qualify registration as MSME, it is necessary to apply for UAM. – Section 8 Companies. To incorporate the business as MSME and avail benefits of government schemes. 3. Eligibility To be applied by any individual/entity fulfilling the minimum registration criteria specified for different Company types in the Companies Act,2013. For example minimum directors/shareholders, minimum capital, etc. To be applied by any individual/entity recognized as MSME based on the minimum investment criteria in plant & machinery and service equipment. – related documents as prescribed on the common portal of Udyog Aadhaar. 5. Mandatory or Not Mandatory for all entities opting to work as a registered company organization. 6. Benefits An entity shall become eligible for all scheme benefits and tax exemptions provided by the government for company organizations. The entity shall become eligible to avail tax exemptions and policy benefits for MSMEs with the subject to certain conditions. 7. Renewal Policy Renewal of registration is not required, except for certain specified situations by MCA. Have to be renewed for certain entities after 5 years. Registration under Udyog Aadhaar for MSMEs is required to declare an entity as MSME based on the investment made in the assets. 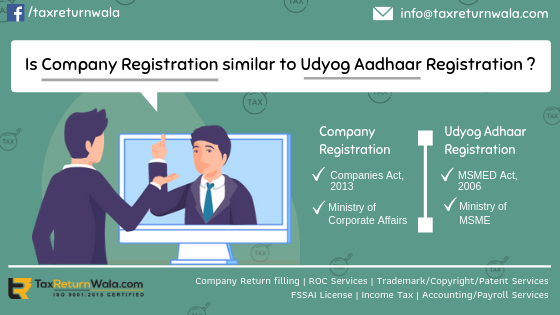 The registration reflects for eligibility of entities for applicability of regulatory procedures, schemes, and benefits issued by a government for MSMEs. While to commence business as a private limited company or public company or in any other company form, it is necessary to get registered under the Companies Act 2013. Thus, both registration differentiates entities in many aspects. But If a company qualifies eligibility for MSME, It can avail benefits opted for MSMEs through Udyog Aadhaar registration.